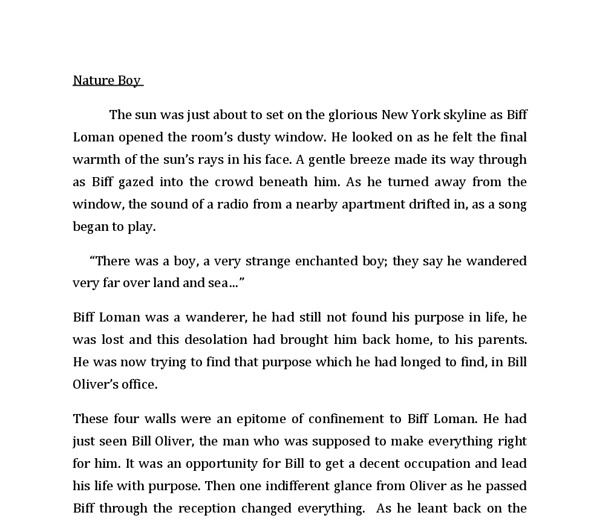 ﻿Nature Boy The sun was just about to set on the glorious New York skyline as Biff Loman opened the room?s dusty window. He looked on as he felt the final warmth of the sun?s rays in his face. A gentle breeze made its way through as Biff gazed into the crowd beneath him. As he turned away from the window, the sound of a radio from a nearby apartment drifted in, as a song began to play. ?There was a boy, a very strange enchanted boy; they say he wandered very far over land and sea?? Biff Loman was a wanderer, he had still not found his purpose in life, he was lost and this desolation had brought him back home, to his parents. He was now trying to find that purpose which he had longed to find, in Bill Oliver?s office. These four walls were an epitome of confinement to Biff Loman. He had just seen Bill Oliver, the man who was supposed to make everything right for him. It was an opportunity for Bill to get a decent occupation and lead his life with purpose. Then one indifferent glance from Oliver as he passed Biff through the reception changed everything. ...read more. Biff closed his eyes and managed to conjure up a smile; he slowly took a deep breath and exhaled like it was his last. His breath seemed to remind him of hope, a feeling of relief which he had never felt before. He foresaw the harrowing landscape of the glorious south where his heart longed to belong, towering hills like monuments overlooking the vast barren plains, the limitless sky watching over the endless ocean of land, like a mother looking over her new born child enclosed in her precious embrace. The shade of luminous gold in the palette of the sky, painted so delicately as the sun set its way to slumber in the western horizon, receding its rays and biding farewell to the world that stood before it. Biff then remembered his father and that day in Boston. He remembered how he had opened the door and how it had changed every single fragment of his life. Biff had felt his heart sink to depths which he could not even comprehend. Biff witnessed the existence of another woman in his father's life who seemed to be the object of his malicious desires. She was intoxicated enough to be unaware of what has happening before her, despite Willy's pathetic attempts to conceal and condemn what Biff had clearly understood. ...read more. As Biff held the fountain pen in his hand, slowly lifting it towards him a reflection carved its way on the green marble of the pen. He could see himself looking into his own eyes lost in such discontent. He grasped the pen with the veracity of his fingers and placed it in his pocket. In an instant, he rose up from the chair as if a spirit had just left his body from possession. 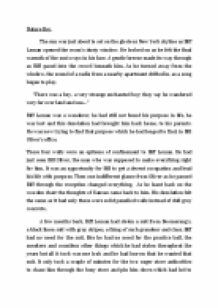 Biff Loman descended down the endless flight of stairs like a child running to the comfort of his parent's arms, his desperation to escape from the building overcame any possibilities of himself colliding into whatever came before him. He had not a single care in the world than to escape. His breaths were as heavy as the downpour of rain on the silence of the cold night, his face weary, tired and exhausted as if he had just escaped from the jaws of death. â As he flung open the doors of the building, he immediately faced the crowd who he was peering into moments ago. Biff stood awkwardly in the midst of the crowd like a child lost in the fair, uncertain of which direction to take and who to follow. In the midst of the chaos of the crowd, Biff heard the song end with it’s final words. “The greatest thing you’ll ever learn is just to love and be loved in return…” ...read more. He reflects for a moment. I get the feeling that perhaps he might have experienced past family heartache and was just about to probe the question when his PR gives me the evils and tells me to stop. I open the text from my mother; 'Hurry.' Still no explanation. Still no reasoning as to why she has called me down here at no notice. Shoving the phone back in my pocket, I turn the corner and see my mother lying dead on the kitchen floor. I freeze. "That was close. Who was he and how did he know Celeste's true identity? I'll have to ask around and see what I can dig up," Jonah lights a cigarette and takes a deep breath in. *** "Hmm, mm. Oh hello, back from your shopping so soon?" Celeste asked Jonah after regaining consciousness. Gone? Raleigh? Oh I...I... Mason: [getting quieter, spotlight fading] I 'eard it all from one of the nurses sir. She said that neither of them suffered much. Raleigh never made the 'ospital as far as I know. Stanhope: I hate this war! In Cold Blood: Creative Writing. Alvin Dewey, A Monologue. I am here to resolve this and to find out what led to this and what this leads up to. I have become a monster, a likely one to those who committed this crime. every colour imaginable and enough jewellery to make even The Queen jealous. By the looks of things, the boys and girls of the town were having a competition of who could be the most outrageous with their outfits, and I?m not sure which ones were winning. loosen my tie from the choking grip it has on my neck. As I take the rifle from the hands of my thug, I understand this is my way out, my only way out.